The URC-68 requires a very specialized battery, the BA-1112/U, for operation. This battery is long out of production. In the book "Power Up" there is a plan to replace the original 10 "AA" Mercury cells with 8 "AAA" Alkaline cells using battery holders and a dead BA-1112/U, but even dead BA-1112/U cases are hard to find. This battery adapter will use either 9 Alkaline "AA" or 10 NiCad or NMH cells. 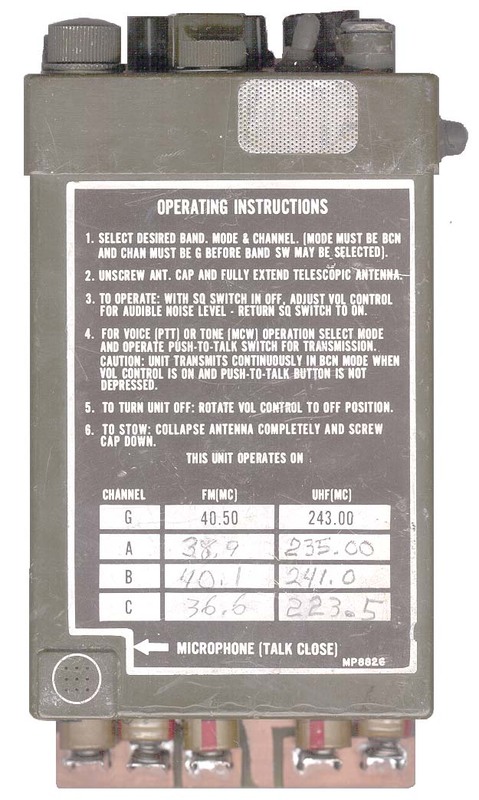 The idea behind this battery adapter is to support use of the URC-68 on the ham bands, not for survival. For survival use the batteries should have a long storage life and flat voltage curve like the original Mercury battery or the modern LiMnO2 or LiSO2 batteries. Using the Li batteries for ham use is very expensive compared to ordinary AA cells. The radio interface socket PCB is at the top and the two brass "Pins" are the sockets. One clip for each "AA" cell. Two "AA" cells between each pair of positive and negative contacts. Right view installed on URC-68 with 10 "AA" cells, but no mounting screw yet. You can see that the 1112BA extends about 3/4". Front of URC-68 with 1112BA installed on back. You can see the 1112BA is a little longer than the radio. Notice that channel "C" is now 223.5 MHz (220 ham band simplex frequency) by adding the proper crystal. Radio Socket board is about 3" x 0.6" and has two sockets that mate with the pins on the radio. It turns out that standard test prods fit into the 1112BA radio mating sockets, makes it easy to check voltage. 13 June 2002 - the first unit has about 0.136 too much distance between the positive and negative battery contacts, so needs rework. But it does power the URC-68 OK.
14 June 2002 - Moved battery contacts closer toghther and now have excellent contact, 1112BA now needs a mounting screw then it's done. 19 June 2002 - testing with a second URC-68 has shown that 10 "AA' Alkaline cells (15.68 V) is too much voltage for the URC-68. It causes the radio to stop receiving after about 10 seconds, probably over heating the 9 V regulator chip causing it to go into self protect mode. If the original BA-1112/U was made up of 10 each Mercury cells then it's terminal voltage when new would have been 13.2 Volts. 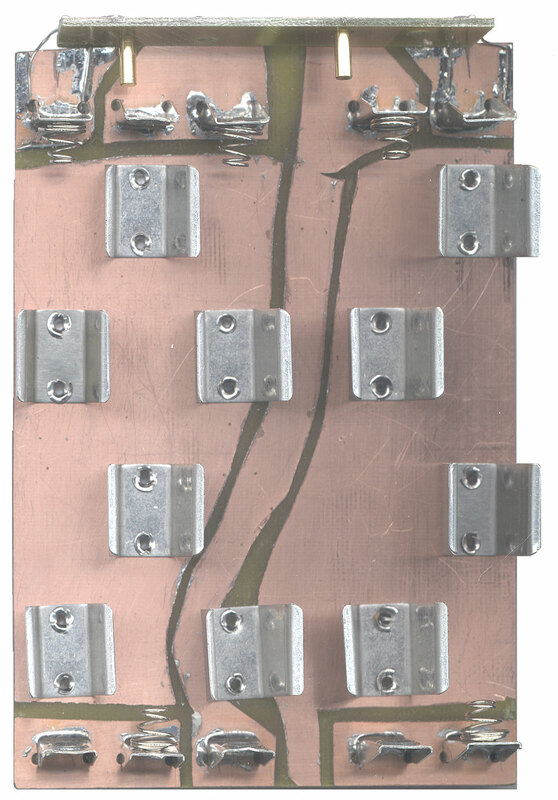 Most of the tests described in TM 11-5820-767-34 are made at 13.6 Volts. Other tests are at 11 Volts and 12.5 Volts. Need to remove 1 "AA" cell thus providing 13.68 Volts with fresh "AA" Alkaline cells. If NiCad or NMH cells were used then only 10.8 Volts would be present, 10 of these would be much better. 9 Aug 2002 - using 10 each NMH "AA" cells provides about 13.3 Volts when fully charged and is ideal for the URC-68. 10 each Alkaline cells is too hot. Looks like a diode is needed to select either 9 Alkaline or 10 rechargeable cells. This requires a new layout where there are contacts for a single cell. As delivered the URC-68 was crystaled so that Channel G (Guard) was 40.5 MHz in the FM mode and 243.0 MHz in the UHF mode. By installing a crystal at 46.725 MHz in the channel C socket the UHF radio frequency is 223.5 MHz, the 220 ham band simplex calling frequency. The mode is AM not FM. The radio seems to operate (i.e. Transmit and Receive) on this frequency, but there is no one around here on this frequency? The SSB calling frequency is 222.1 MHz, can that be used as the AM calling frequency? Next, and a bit more of a streach is to try a 61.125 MHz oscillation frequency to give Ts/Rx on 51.0 MHz. This crystal did not oscillate in two different URC-68 radios so it must be too far out of band. For this adapter I don't see a large market. But if you really want one we might get a small number of people to sign up for one then figure out the price each. The cost of printed circuit boards comes down as the quantity goes up. Between 2002 and 2006 only 3 people have asked about the adapter or crystals, so there's not enough interest for a piolet run or Xtal group buy. For crystal vendors see my Crystal web page. This is the time this page has been accessed since since 13 June 2002.